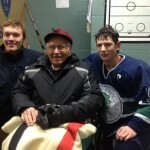 It’s not every day or every school that gets to welcome home a captain of a one-loss varsity hockey team from 1936. 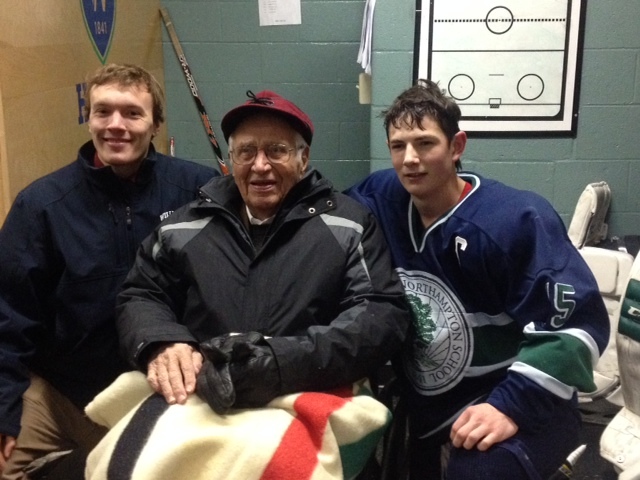 But Williston did just that when Mr. Craig Campbell ’36 visited his alma mater to take in a period of hockey and have an impromptu visit with the boys between periods. His presence attracted a crowd of players from both the boys and girls varsity teams who share a love of hockey and the life lessons that come from team play. Pictured here are Captains Rourke Ferguson, Tyler Scroggins, and Mr. Craig Campbell. Mr. Campbell went on to an illustrious business career after serving his country in the US Army during World War II in the Pacific. Two of his sons also attended Williston. While Mr. Campbell said it was a thrill to return to the locker room and to the school, I can assure him that all who met him were equally thrilled by the experience.